STUDENTS at Our Lady of the Way School, Petrie put on their walking shoes on March 15 to raise money for a Cambodian family in need of a cow. The students took part in a Caritas cow walk in the school grounds to raise enough money to buy a cow for the family in the village of Toul in Cambodia. With access to a cow the family would have a source of milk to increase nutrition, manure to enrich the soil and income from selling any calves. Through its cow banks Caritas Australia, lends a cow, which costs about $325 in Cambodia, to a family and when it has had its first female calf, the calf is returned to the cow bank, repaying the debt. 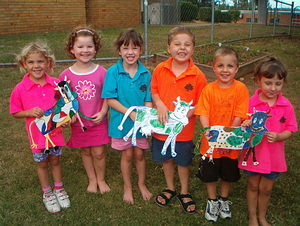 A number of cardboard cows were on display at the school and students coloured in one each time they hit the $325 target. Assistant principal for religious education Jenny Long said the students had raised more than $390 through their class Project Compassion boxes. She said they also raised more than $2000 through the walk. Previous: ARE WE THERE YET?